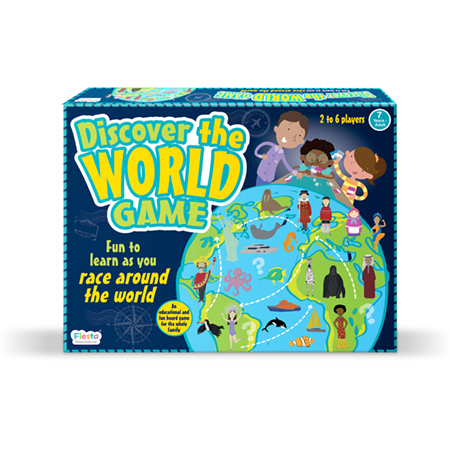 We really liked the way in which the game improved childrens geographical knowledge in a fun and engaging way; our testers learnt lots of new facts as they played. We liked it encourages children to work together to find the countries, and we expect that children will get better at the game the more they play, as their geographical knowledge grows. The gameplay was simple and the children were able to follow the instructions by themselves. Younger children spent a long time finding the counties but this didnt detract from their enjoyment as it was all part of the game; they also found some of the cards hard to read and needed the help of an adult/older child. Race around the world with this exciting family game: compete to be the first player to reach your destinations and collect the most Destination Cards. This geographical board game will keep you on your toes as you pick up Arrival or Journey Cards designed to help or cruelly hinder your travel!. Plus, with every Destination Card you can learn fascinating and useful facts about countries, cultures and continents as you play. The sturdy fold-out game board and the beautiful solid box packaging will ensure that this game can remain a family favourite for years.